Former Sunderland goalkeeper Tim Carter has been found dead in Manchester. The body of the 40-year-old, from County Durham, was discovered in bushes by a passer-by in the Highfield Close area of Stretford, Greater Manchester. Emergency services were called, and he was pronounced dead at the scene by paramedics at midday on Friday. The death of Mr Carter, recently appointed as Sunderland Academy goalkeeping coach, is not being treated as suspicious, according to police. He played 50 games for the Black Cats, between 1987 and 1992, and had been the first-team goalkeeping coach before the arrival of Raimond Van Der Gouw in summer 2007. 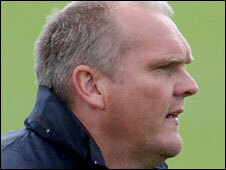 Mr Carter also coached the goalkeepers in Estonia's national side on a part-time basis. A spokesman for Greater Manchester Police said a post-mortem would be carried out in due course. Carter started his career at Bristol Rovers and also played for Hartlepool, Millwall, Oxford and Halifax.